An excellent pub for a quiet midweek pint just north of the city centre near Duke Street and the University of East Anglia's Mary Chapman court residences. Also but a hundred yards from the Golden Star pub where I drank my first pint of 'real ale' in June 1992 upon the recommendation of my good friend Simon Wilson that I was too old to drink cider and that I really didn't want to be drinking that Australian stuff starting with 'F'. I've never looked back since! Anyhow, enough waffling. A great pub with a cellar bar that they open up sometimes at weekends and it's a smoke-free zone too down there. There's a couple of Adnams beers on offer as well as some very well kept guest ales which are always worth trying. There's a nice conservatory type bit around the back which is often a bit quieter. They also do food at lunchtimes though I've not tried it, and do evening meals on Saturdays. 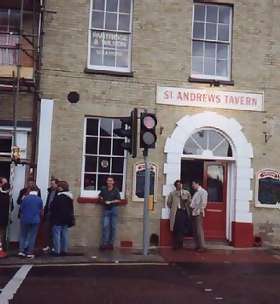 When I popped back during 1998 the whole pub was full to overflowing at around 3pm on a Saturday afternoon so I guess it's a rather popular drinking place.